Plus, Buck is probably gone after this season, as well as Adam Jones and Zach Britton. On the plus side, it'll be really easy to get tickets. Let's invest in some O's natty Boh and go to work! Natty Boh is also releasing their first new beer in three decades. it's called Crab Shack Shandy, a lemon shandy beer for summertime. I'm sure the bars down there will be stocking it. I remember less than ten years ago, Boh was hard to come by down there. I guess I can thank the hipsters for helping bring Boh back to prominence.....and for making it the most expense cheap beer in Baltimore. What does the Cap drink these days? Since you're familiar with Ocean City, what's your take on the Orange Crush? I think it's a great summer drink, but I can't drink a lot of them due to the acidity. While I thankfully can afford better than Hamms or Glueks these days, I’m still not so picky. I prefer IPAs but like a decent kolsch, Hefeweizen, or most anything that isn’t TOO dark. (No porters or stouts for me.) and I’m not into the gimmicky infusions. Wines, I like reds. Nothing too sweet. Booze, I’m ok with most mixed drinks, minus gin. But I don’t drink a lot of liquor or have any palette for it. I wish. Nah, it's usually common cards. Although I did spot a 1989 Fleer Jamie Moyer once. I did once win a 1993 Topps Cal Ripken card on the Boardwalk when one of the arcades had a baseball pinball type machine, but you'd win baseball cards instead of tickets. It was usually common cards, but every now and then, you'd get a star player. Porters are great when no leaving the house is required. I love a good porter, especially in the fall or winter. In summer, I prefer a lighter lager or pilsner beer. As I've gotten older, I've taken to sipping whiskey or rum, depending on the weather, and find myself making a lot less cocktails. I got a vintage O’s hat for the games this year! Tickets should be easy to get based on their horrid start. 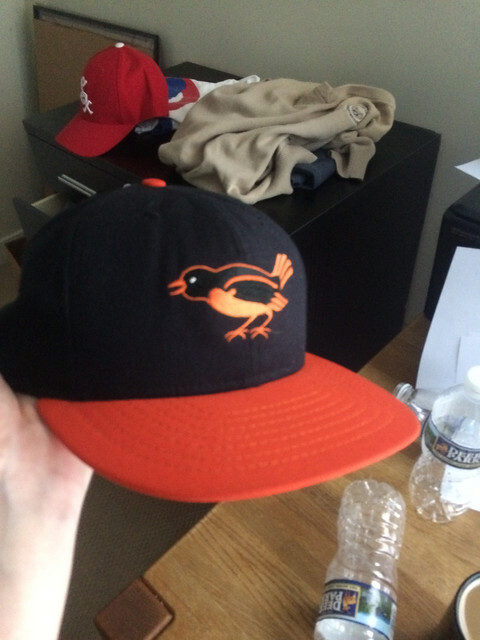 I used to have a 1966-74 throwback cap, which was the black cap, orange bill, and cartoon bird. But, that's basically the current road cap, which I got a few years ago when my throwback cap was worn out.